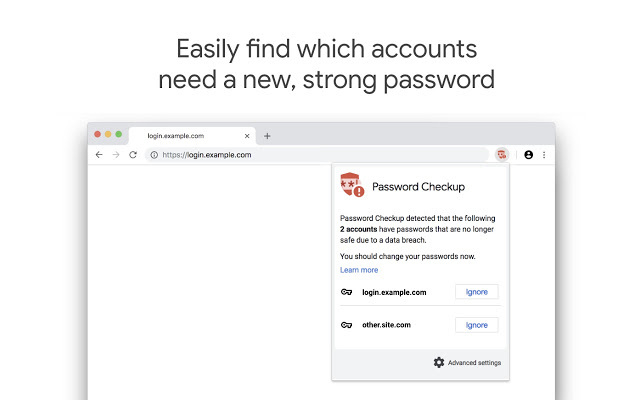 Google official has now launched a new extension called Password Checkup in the Google Chrome Store to help users detect leaked passwords. After the user installs the extension, it will automatically compare the database provided by Google for security check. If there is a password leak, the extension will issue a security reminder. Just like the password leak warning that Firefox introduced earlier, Google’s expansion relies on a large number of leaked databases. Google engineers collect and archive these databases, and after installing the extension, users can use their comparison function to check the data set. The extension will automatically read the form account and password stored in Google Chrome, then hash it and send it to Google Server for comparison. Google emphasizes that all encryption is done locally, so users don’t have to worry about accidental leaks during password transmission. Previous versions of Google Chrome have introduced random password generators, and Google can generate random passwords and synchronize when users try to register. For users to use Google Chrome for automatic synchronization, so do not need to remember the password, the security is relatively improved after using the random password. Random passwords do not prevent other websites from leaking user passwords, but at least after the leak, users do not need to change the same password to prevent other websites from leaking password. Download the Password Checkup tool here.